Amoeboid movement is the most common type of movement in eukaryotic cells. 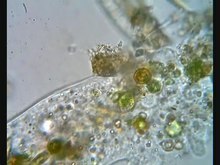 It is a crawling type of movement got by pushing out cell cytoplasm in the form of pseudopodia ("false feet"). The cytoplasm slides and forms a pseudopodium in front to move the cell forward. 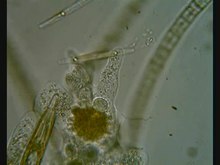 This type of movement is observed in amoebae, slime molds and some other protozoans such as Naegleria gruberi, as well as some cells in humans such as white blood cells. Sarcomas, or cancers arising from connective tissue cells, are particularly good at amoeboid movement, thus leading to their high rate of metastasis. The exact mechanism is still unknown. It involves actin-myosin molecules inside the cytoplasm. ↑ Nishigami, Yukinori et al (2013). "Reconstruction of active regular motion in Amoeba extract: dynamic cooperation between sol and gel states". PLoS ONE 8 (8): e70317. doi:10.1371/journal.pone.0070317. http://www.plosone.org/article/info%3Adoi%2F10.1371%2Fjournal.pone.0070317. Retrieved 29 October 2014. ↑ Preston, TM; Cooper, LG; King, CA (1990). "Amoeboid locomotion of Naegleria gruberi: the effects of cytochalasin B on cell-substratum interactions and motile behavior.". The Journal of protozoology 37 (4): 6S-11S. PMID 2258833. This page was last changed on 7 February 2017, at 13:19.